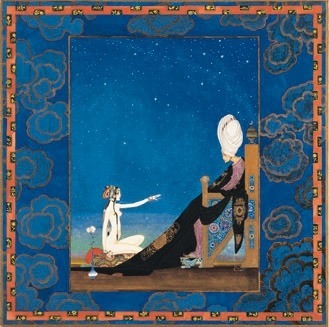 Once again I am entranced by Nikolai Rimsky-Korsokov’s symphonic suite, Scheherazade. Based on the Arabian Nights tales, the music takes you on a journey in four parts—through joyous festivals, swashbuckling characters, treacherous oceans, and tender passionate romance. Composed in 1888, five years before the Lumiere brothers invented the first motion picture camera in 1895 (a piece of film history trivia I now know from watching Martin Scorsese’s Hugo recently and enjoying it thoroughly). It’s a true delight from beginning to end and I highly recommend giving the approx. 65 minute runtime, a good listen. Orchestration: piccolo, 2 flutes/piccolo, 2 oboes/English horn, 2 clarinets (A, B♭), 2 bassoons + 4 horns (F), 2 trumpets (A, B♭), 3 trombones, tuba + timpani, bass drum, snare drum, cymbals, triangle, tambourine, tam-tam + harp, strings. I often hear elements of Scheherazade in film music, especially in action adventure films of the 20s, 30s and 40s. One of the more deliberate quotes of Scheherazade is in The Thief of Baghdad (1924). There are multiple versions of the film with different scores with varied arrangements and instrumentation but each follows the daydreamy tone of Scheherazade and the original cue sheets by James Bradford. There are moments in the film where MAMPO plays direct excerpts from Scheherazade which is what drew me in initially. Especially their use of quoting the incredibly beautiful solo violin theme (representing Scheherazade herself) during moving scenes in the film. Here is the original cue sheet MAMPO used in their recording along with their cue notes. There is also the 1940 remake with a score by Miklos Rosza which is much more romantic in its themes but nonetheless incredibly spellbinding. Listen to all four movements of the Moscow Symphony and then go back and listen to classic scores by Max Steiner, Franz Waxman, Alfred Newman, Elmer Bernstein, Jerry Goldsmith and even John Williams. You’ll hear Scheherazade whispering her song in a lot of their scores. As a side note, I was watching The Wizard of Oz over my holiday break when I noticed that the rhythmic motif of Miss Gulch/The Wicked Witch of the West (I found a short version here) sounds very similar to Scheherazade’s fourth movement, vivo section, (which represents the sea and Sinbad’s shipwreck). It’s mostly similar in rhythmic and chromatic tone, but it was a delightful comparison to notice. That’s all for now. Enjoy and leave me a note if you find any other similarities to Scheherazade in new or old scores!